Sometimes our efforts to nod attentively and assure people we are listening is a purposeful strategy that we employ in the service of efficiency and multitasking. But what about the times that we genuinely want to listen but find it unexpectedly difficult? How long are you able to listen to someone without thinking about your own opinions, how you want to respond, or what you are going to say next? Why is this so hard to do? These questions feel particularly relevant to Ben Franklin Circles. At least once a month, circle members make a concerted effort to go somewhere specifically to listen to others. The last time I paid attention to how much time I spent listing vs. how much time I spent thinking about what I wanted to say, I realized I was missing out on many of the contributions of my peers, contributions I had come to hear. Ben Franklin Circles have helped me realize that I have far less control over my ability to listen then I had assumed. A short article by Eric Westervelt from 2014 provides some context for this experience. Westervelt spoke with writer Julian Treasure, whose observations I think about often while in conversation with fellow BFC group members (yes, sometimes while they are speaking). When I catch myself “failing” to be able to listen, it helps to remember that this is a difficult skill that I’ve never really had a chance to practice. Most of us can imagine how we would practice an athletic skill like a jump shot or an artistic pursuit like ceramics. It can be hard to imagine what that looks like when it comes to listening. Luckily, there are creative ways to do this. A few years ago in a workshop, I was told that the facilitator would time us and we would each have 2 minutes to speak. I expected the following conversation to be stressful and awkward. But soon after we started I realized that knowing exactly when my turn was coming and how long it would last, freed me up from thinking about those things and allowed me to do a better job of listening as each person spoke. It made the whole conversation more fun and more enjoyable. In a brief TED talk, Julian Treasure offers suggestions for individuals who want to improve their ability to listen. His first suggestion, Silence, will be familiar to members of Ben Franklin Circles, who know that Silence is one of Franklin’s virtues. For years, I didn’t realize I was missing out on a life skill that now feels incredibly vital and valuable. 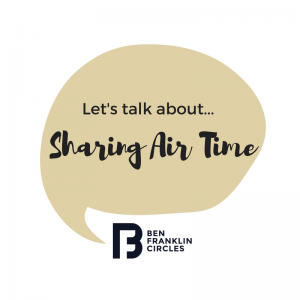 I am thankful that (for those of us looking for them) Ben Franklin Circles can offer many opportunities to develop a listening practice, as individuals and as a community. Danyel Addes is a Program Manager at the Belfer Center for Innovation and Social Impact at the 92nd Street Y in NYC.